Kaashif Eazazuddin, DO, is an otolaryngologist who specializes in the treatment of conditions of the ear, nose, and throat. He sees patients of all ages, from children to the elderly. He is a member of the American Academy of Otolaryngology - Head and Neck Surgery, the American Osteopathic Colleges of Ophthalmology and Otolaryngology - Head and Neck Surgery, and a member of the American Osteopathic Association. 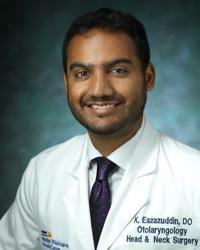 As a physician who specializes in otolaryngology, Dr. Eazazuddin sees patients for sinus disease; thyroid disorders, including cancer; head and neck cancer; voice disorders; tonsillitis and laryngitis; hearing loss; balance problems; difficulty swallowing; and infections of the ear, nose, and throat. He applies comprehensive treatment techniques and offers a variety of surgical options, including traditional surgery as well as endoscopic surgery and microscopic surgery. Dr. Eazazuddin received his medical degree from the New York College of Osteopathic Medicine. He then spent one year doing research at the Pasha Snoring and Sinus Center before completing a residency at Saint Barnabas Medical Center in otolaryngology - head and neck surgery. Throughout his training, Dr. Eazazuddin has worked at Saint Barnabas Medical Center, Newark Beth Israel Medical Center, and Memorial Sloan Kettering Cancer Center with the Head and Neck Cancer Team. Even as a young child, Dr. Eazazuddin gravitated towards healthcare. He knew that improving the health and lives of others was what he wanted to do. This passion is what drives Dr. Eazazuddin each day to provide the best care possible for his patients. “I treat my patients in the same manner that I would want my family members to be treated. I take the time to listen to my patients in order to understand their symptoms, their concerns, and their treatment goals. Honesty is the foundation of a trustworthy patient-doctor relationship. I am an advocate for my patients and I will always be honest with them in all scenarios.